Fosway Group, Europe’s #1 HR industry analyst, includes the Eurekos LMS in its Potential Challenger zone in the 2019 Fosway 9-Grid™, highlighting the product’s user-friendly interface, integrated authoring and high value for money. Fosway Group – Europe’s #1 HR Industry Analysist has just released its 2019 9-Grid™ for Learning Systems. In an extremely crowded and highly competitive market, Eurekos was nominated as “Potential Challenger” with a strong “value for money” ratio and positive market potential. “We are of course extremely proud about the designation. Having been in the market for only a year, Eurekos has made an amazing entry and we are very honored and humbled to be on the Fosway 9-Grid™ together with the best learning systems in the world”, says Kenny Munck, CEO of Eurekos. The Eurekos platform is designed to support the full costumer journey from content production to distribution, enrollment and statistics and includes valuable functionality like e-commerce and a global marketplace with a completely new perspective on learning. The focus for Eurekos has always been to build an innovative platform to help reduce the cost of producing and maintaining a great learning experience. According to Kenny Munck, the nomination as a “Potential Challenger” is exactly right: “We are definitely ready to continue on our journey and together with our fast-growing number of clients, we will make sure that the Eurekos platform will rise to the challenge” says Kenny Munck. Fosway Group is Europe’s #1 HR Industry Analyst. 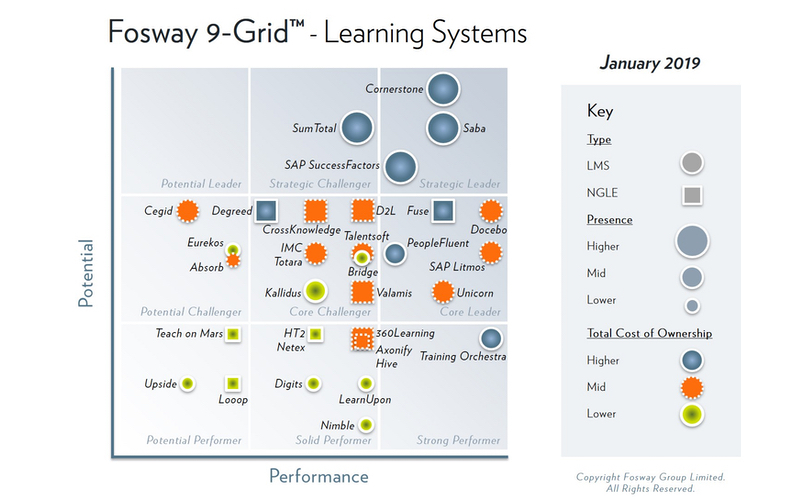 The Fosway 9-Grid™ provides a unique assessment of the principal learning and talent supply options available to organization in EMEA. Now in its sixth year, the analysis is based on extensive independent research and insights from Fosway’s Corporate Research Network of over 150 customer organisations, including BP, HSBC, PwC, RBS, Sanofi, Shell and Vodafone. Visit the Fosway website at www.fosway.com for more information on Fosway Group’s research and services. Eurekos is headquartered in Copenhagen with offices throughout Europe. As a learning technology company, the flagship product is the Eurekos Learning Management System, which is the first of its kind to help clients and partners create impactful learning content and repurpose old content, at record speed. It’s an LMS that puts content first, but it’s so much more. Eurekos delivers powerful administration, insightful analytics, and engaging social and collaboration tools.